I have just finished reading a book about old people’s homes in Holland (for a book group before you ask!) and decided to pick this one up because it is about the German occupation of Holland during WW11. I didn’t know much about so it was an interesting read. Hanneke Bakker is an 18 year old girl living in Amsterdam during the Second World War. When we first meet her she is on her way to make a delivery of black market goods for her employer, the local undertaker. She goes around delivering hard-to-get items to the wealthy people of Amsterdam. She is also mourning the loss of her boyfriend, Bas, who was killed in the short lived resistance of the Dutch Army before the they succumbed to the German invasion. This was two years previously and Hanneke feels a lot of guilt. She thinks that Bas, who joined up early, did so because he wanted to impress her. Hanneke is stopped by a young German soldier and flirts her way out of trouble. She then calls on her next customer, Mrs Janssen, who has several sons. One has been killed and the others have fled to America and England. Her husband has also not been seen for a while. She asks Hanneke to do her a favour. She has been harbouring a young Jewish girl who was a friend of the family. Her husband had been hiding the family at his factory but they had been betrayed and all been killed, including her husband, except for the girl. 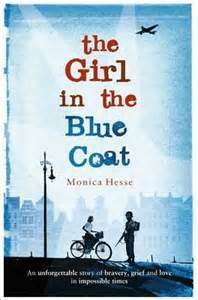 The girl has since gone missing and Mrs Janssen wants Hanneke to find her, as she is the only family she has left. Coincidently, the same day her dead boyfriends brother Ollie appears at her door and, although Hanneke does not want to become involved, she agrees to meet with a friend of Ollie and realizes that he is involved with the Dutch resistance movement. He knows someone that can help her find Mirjam (the Jewish girl in the blue coat) and bring her back to Mrs Janssen and safety. Judith is a member of Ollie’s supper club and is Jewish. She works at the local centre where Jews go after they have been rounded up by the Germans. Her sister Mina works in the crèche looking after the very young and both girls are active members of the resistance. We also meet Willem, who is Ollie’s roommate. What follows is a roller coaster of missed connections and double dealing. Hanneke is unwittingly drawn in to helping the resistance and is nearly caught on a few occasions. All the time she is carrying this guilt about Bas and we learn some of their back story. Hanneke is a strong character that makes you feel that, if you were in the same situation as her you would hopefully be as brave. The people of all occupied countries suffered such fear and hardship during the years that the Germans invaded their countries and people must have been constantly afraid of doing anything wrong. The rounding up of the Jews is poignantly portrayed, a boy cries because two girls in his class have been deported to concentration camps because they are Jewish. Hanneke has no hope of a future because she cannot see past her grief. Her relationship with her parents also changes significantly during the course of the book. Every time I read a book like this, and there are so many out there that I have read a few, it astonishes me. How can ordinary people cope with such an extraordinary situation? Would I be able to cope with it? Would you? People do all sorts of amazing things when they have to, and so many people fought the Germans in their own way, small items of resistance that showed the enemy that they won’t give up fighting for their country. Hanneke is an ordinary girl trying to get by in a world that she no longer recognizes, and this book is so well written that you feel sorry for her but, at the same time, you will wish that you were like her. The book has also been compared to the Boy in the Striped Pyjamas. I didn’t really see the connection, or rather I did but didn’t agree. This book will make you sad, but it will also make you glad that you live in a society where this will never happen again. It’s a study of human endurance and bravery and it made me tingle. Further Reading: The Boy in the Stripped Pyjamas and The Boy at the Top of the mountain by John Boyne.